i rarely see that string thing, and don't often see two handlers (but that's decidedly less uncommon than said string thing), but if that looks standard, i'll take your word for it, i haven't worked the track since like 2005. I believe that string thing is called a stabilizer and if I remember right D. Wayne Lukas was one of the first to use it.
? i see a halter, bridle, that string/rope thingy that's supposed to keep horses calm, stud chain, and two people walking him. is he the horse equivalent of a toddler on caffeine? it has a name! street sense was the first time i saw it (that i can remember), and i feel like i've only seen it on one or two other horses aside from him. So wonderful to finally meet PAINTING THE SKY (2013 m. by Yankee Gentleman - Lone Star Quest, by Lone Star Sky), bred and raced by Sandra New. This highly unusual LA-bred won 2 of 12 with a second and 3 thirds for trainer Brett Brinkman. Now beginning her 2nd career - polo pony! PAINTING THE SKY sure has a pretty head and those photos are wonderful. So good to see a Thoroughbred going on to a second career. 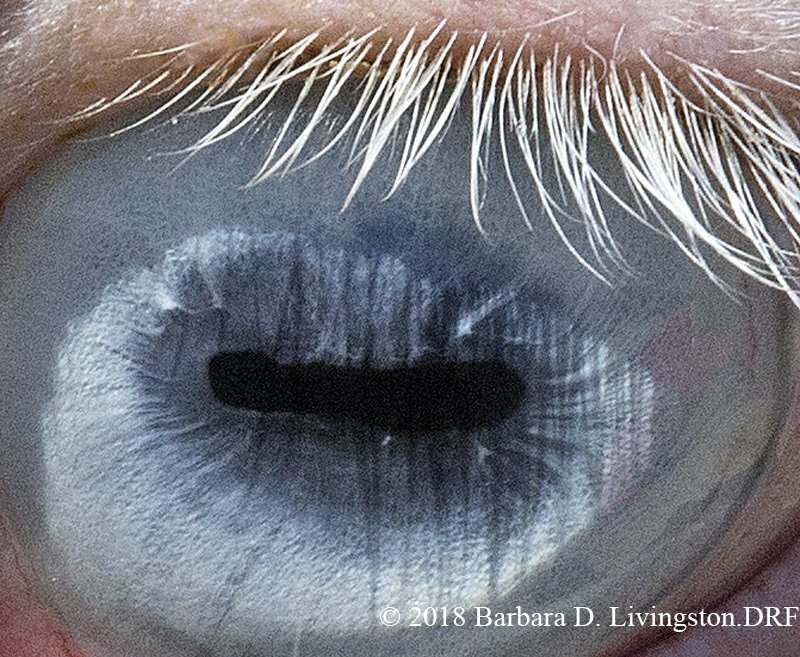 The leader of the U.S. polo team visited Chrome toward the end of his racing career, so I wouldn't be surprised if some of Chrome's foals wind up as polo ponies. 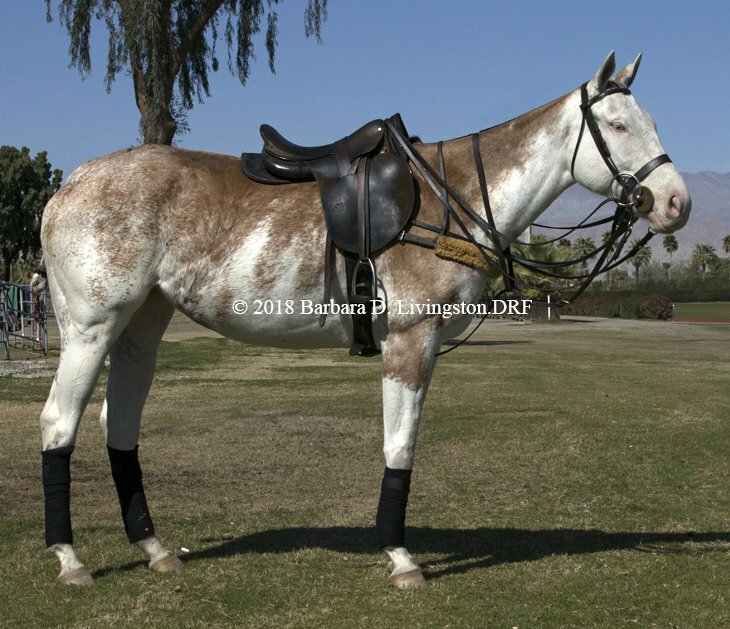 For the color aficionados here, how did a bay stallion and dkb/br mare produce a horse with Painting The Sky's coloring? She is registered as a bay. She has very pretty colouring. She needs some muscling in her neck though. She is a Dominant White over Bay. You can tell on the close up of her headshot that her mane is black. 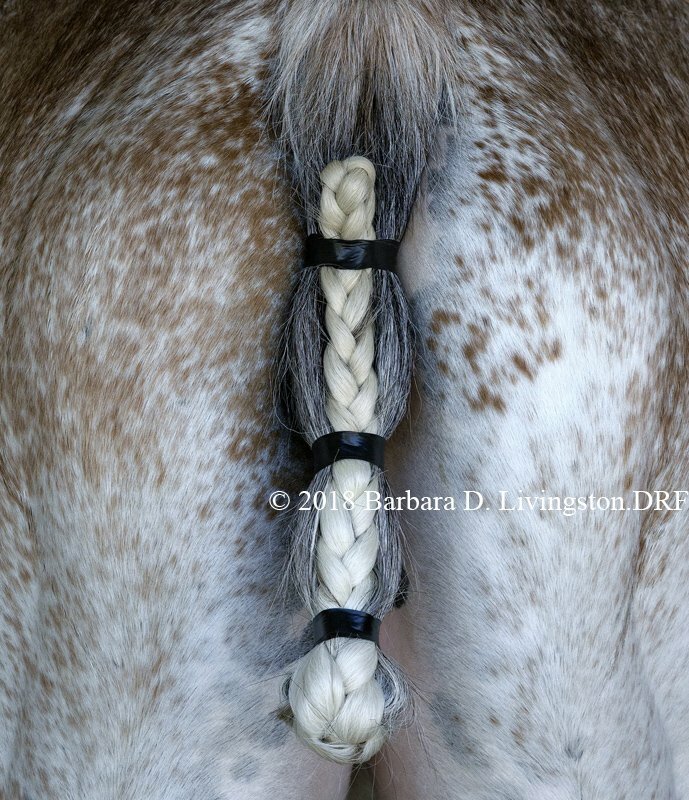 Sometimes the DW "bleaches" out the mane and tail gives the impression of a chestnut, but a DNA test can confirm. In this case though it is directly visible. 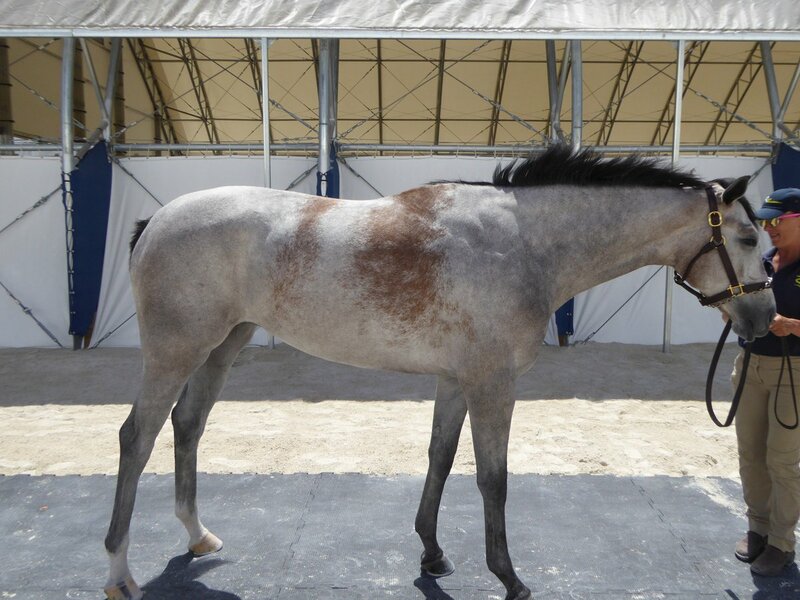 Dominant White is a spontaneous mutation in thoroughbreds, and is so called because it is indeed dominant (you only need one copy of the mutated gene for it to manifest). I'm not familiar with all the lines that have produced DW off the top of my head so looking at her pedigree I don't see anything that immediately jumps out at me. She might be the spontaneous mutation. Unless Yankee Gentleman has produced others I would say she could be, otherwise her dam could be the one producing it. Ridan_Remembered wrote: PAINTING THE SKY sure has a pretty head and those photos are wonderful. So good to see a Thoroughbred going on to a second career. The leader of the U.S. polo team visited Chrome toward the end of his racing career, so I wouldn't be surprised if some of Chrome's foals wind up as polo ponies. 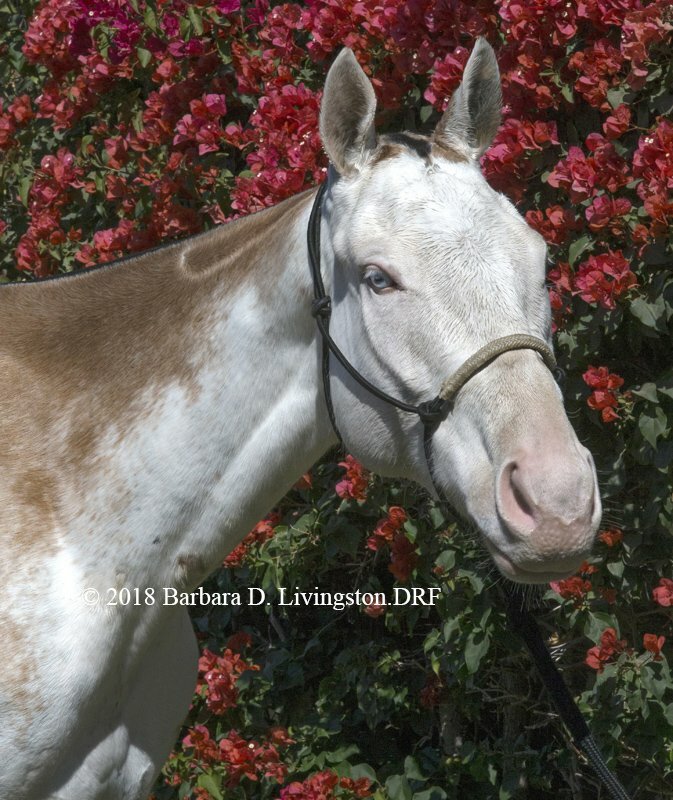 Her color (Dominant White) is due to a mutation in a gene called KIT https://equinerainbow.weebly.com/kit.html. In her case there's a deletion mutation on Exon3, according to https://equinerainbow.weebly.com/white-spotting.html In her case it may be a spontaneous mutation (i.e. her sire and dam don't have it). 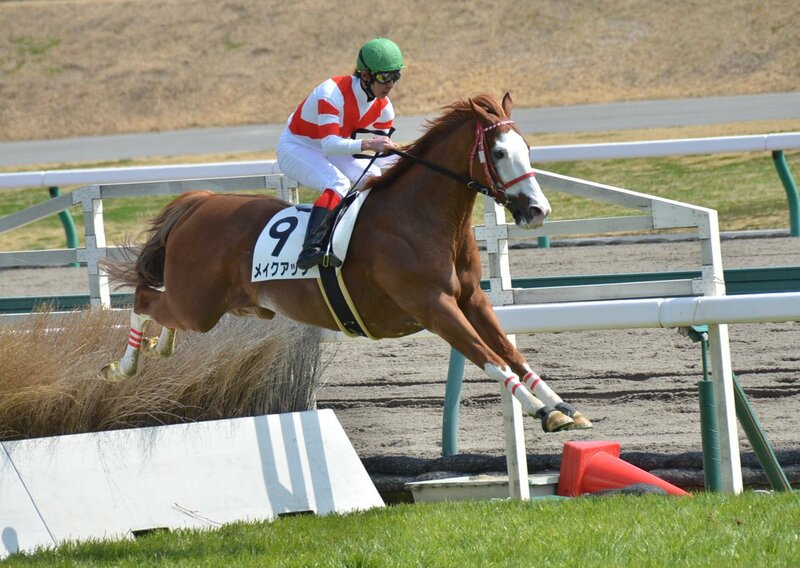 It's hard to tell without pictures, since the Jockey Club doesn't have a color category for 'spotted white'. 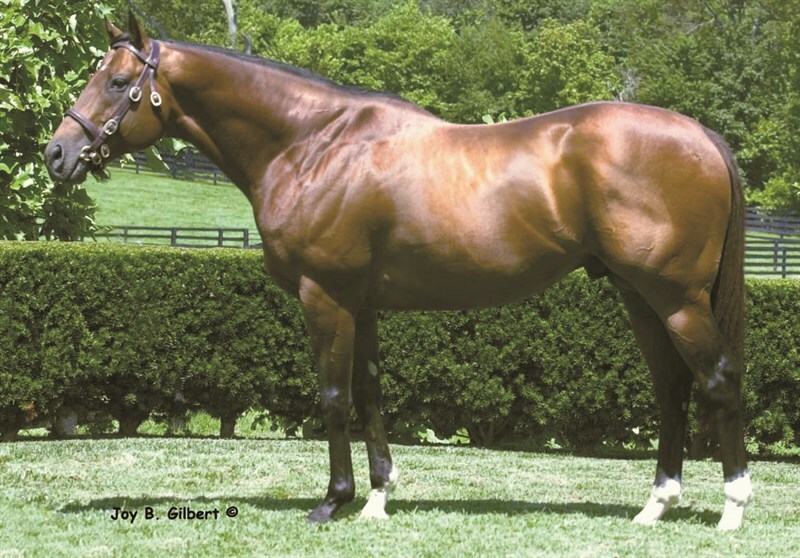 The damsire, Lone Star Sky, was also a bay. I couldn't find any pictures of the Painting the Sky's dam. I just watched a couple of the dam's race replays on Twinspires. She is dark bay/brown with a average size blaze and maybe some socks. Its pretty hard to tell with the quality but didn't see anything unusual and I was able to see both sides of her. Flanders wrote: I just watched a couple of the dam's race replays on Twinspires. She is dark bay/brown with a average size blaze and maybe some socks. Its pretty hard to tell with the quality but didn't see anything unusual and I was able to see both sides of her. Since both parents were solid, it seems that she's the first with the mutation. It'll be interesting to see what happens if she's ever bred! Bleeding/bloody shoulder! It has some mythical explanation in arabians. Very neat! Very pretty filly. Will that coloring last even as she continues to gray out? It should, as the patches are normally unaffected by the greying process. As told to Carole Deegan by a friend, horse master and scholar of the Howettat tribe. Once upon a time many years ago in the desert of Arabia, there was a Bedouin warrior who owned a very special Arabian mare - a mare he rode into battle and to whom he entrusted his life. There was a very special relationship, a bond of trust, love and mutual respect. Either would have given his life for the other. In fact, their bond of trust was so strong that the mare often "read her master's thoughts," doing exactly what he needed at exactly the right time, allowing them to win many battles and to be the envy of all Bedouin tribes. Years passed and one day in a fierce battle the master was severely wounded, falling across the neck and shoulder of his beloved war mare. Although her master was unconscious and she was many miles from home, the mare balanced him across her shoulder, carefully carrying him toward home. She traveled for days without food or water to return her master to his family. When the courageous mare finally arrived at the encampment, she was exhausted and weak, and her master dead. As the family carefully removed the master's body, they saw that the mare's shoulder was heavily stained with his blood, leaving a distinct red mark on her shoulder. Although they had lost their leader, the Bedouin family was eternally grateful to the mare for delivering his body from the battle. They knew that the long journey had been difficult for the mare, and they were very concerned for her because she was heavily in foal. As the days passed, the cherished mare received only the best food and care, and she was visited and admired not only by members of the master's tribe, but all the other tribes in the area. Finally, the time of her foaling arrived, and there was great concern for the cherished war mare. But when the long-awaited foal was born, he was vigorous and healthy and of exceptional quality. He also bore the identical "bloody shoulder" that his mother had from her master's blood. It was then that the Bedouin tribe realized that Allah had rewarded this mare and their tribe for their courage, loyalty and faith and that the "bloody shoulder" was a reminder of his favor. Since that time, hundreds of years have passed, but once in a great while there is a mare of exceptional beauty, quality and courage who foals a very special foal graced by God with the "bloody shoulder." The Bedouins have continued to believe this is a sign of Allah's favor. Who are we to disagree? Thanks for the reminder about the legend, Treve. I'm sure Victoria and Rick would agree that Joyful Victory is a mare of exceptional beauty, quality and courage. 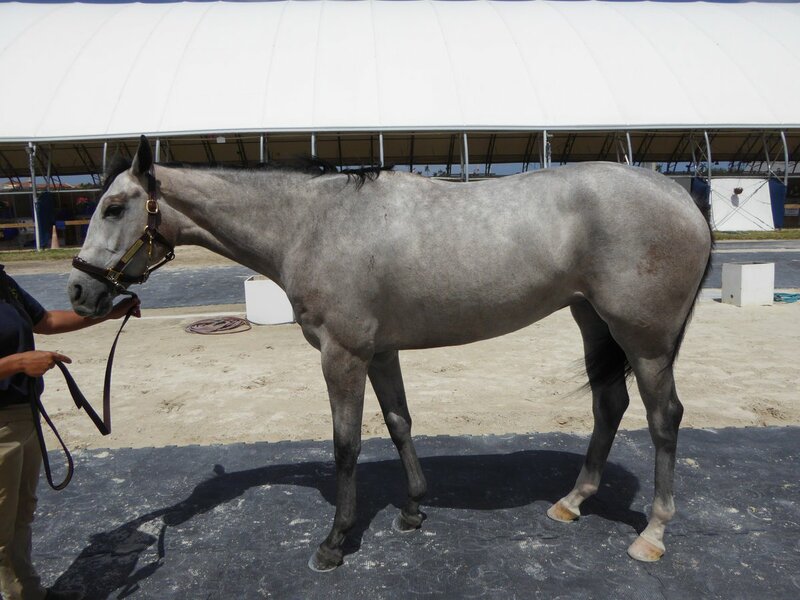 An MdO out of a stakes-winning Tapit mare gets a bid of 'only' $335K? I think she looks pretty good, although the Bloody Shoulder photo is much more flattering than the first shot. Any weaknesses I'm missing? Not surprised about the RNA. I've heard about him but first time I remember seeing him...not sure his breed. I think he's a stunning looking boy. Turn on sound. Our teaser stallion, Spots, is a true #legend in the breeding shed and he knows it!